I was born for this life. I can’t explain the joy it gives me, watching seeds grow into plants, then watching them flowering and fruiting. I have spent many happy hours watering and transplanting and already I am getting dividends. My herbs are on fire – I can barely keep up with them. My tomatoes are growing taller by the day and my cucumbers have begun to flower, giving me my first tiny cucumber of the season. The days are warm and sunny now – between 12 and 15 degrees (54-59 ˚F), but am advised that they may dip again, so I am reluctant to start planting outdoors just yet. Last Wednesday when I bought my onion sets, the knowledgeable lady in the seed shop recommended that I wait one more week before planting. I’m not sure if this is lunar or weather-related advice, but I am more than happy to comply. A few weeks back I planted 100 cups with fennel seeds. Fennel is one of my favourite vegetables but is very expensive here in Lithuania. I have never grown it before but I’ve been told it grows well here. However, it needs to be started indoors if you want decent-sized bulbs by the end of the season. All but four of my cups germinated. Thankfully a few had more than one seedling, so I transplanted a few to make back up to 100. If all of them mature I will have enough fennel to see me through the entire winter. I can’t wait to see how they develop. This week we began our outside preparations for planting. Arūnas rotovated the vegetable plot, enlarging it to twice what we had last year. We also enlarged the salad bed, which is closer to the house and handy for grabbing leaves and herbs while cooking. We burned a tin of sulphur in the polytunnel to kill off any harmful fungi. It now needs to air for several days before being wiped clean. I can then hoe the beds, ready for planting. Since the weather has been fine Arūnas has had an opportunity to work on our new chicken coop. It took us both a while to get over the loss of our entire flock last year. We are building a new, insulated coop where the chickens can stay year-round. I am hoping it will be ready within the next few weeks as I really miss having animals around the place. I know planting seasons vary considerably from country to country (or even state to state) – I’d love to hear what stage you’re at and what vegetables you’re planning for this year. Disclosure: This post is not sponsored in any way. It does contain links to products that I have personally selected and recommend. If you purchase products via the links in this post I receive a teeny, tiny commission. It’s so easy and time-saving to freeze fresh tomatoes. When I pick more tomatoes than I can use, I freeze them in zipper-bags made for the freezer for future cooking. I may peel them – or not: I trim them as needed. I cut them into pieces into a measuring cup along with any juice; I label the quantity on the freezer bag so I know it later on. Brilliant – thanks Frances. I’m definitely going to try that this year. Thanks Sally. I think the weather is slow to warm up all round this year. I hope to start my outdoor planting later this week, but today it’s only 8 degrees, so still quite chilly. I agree that frozen tomatoes would likely only be good for cooking, but then again so are jarred tomatoes, so I reckon it’s worth a shot! I like the idea of freezing small batches on the day the tomatoes are at their prime rather than waiting for a decent batch to jar. But I’ll have to test it first – I don’t want to waste any! I love the idea of drying some. I have a dehydrator but haven’t tried tomatoes in it yet. I love sundried tomatoes, though, and they keep for ages, so I’ll definitely try that this year. Best of luck with your planting! J. A tip about growing tomatoes – one of the many gardening things my Dad, Norbert Onaitis (one of 10 children of immigrants from Lithuania) taught me. When the plants have several sets of “true” leaves and the roots are filling the pot, carefully remove them and re-pot in a somewhat larger pot AND PLANT THEM DEEPER, trimming off the lowest stems, if necessary. I don’t grow tomatoes from seed here in the high desert (6,000′) of New Mexico; I buy plants that are grown locally; I usually “pot up” tomatoes twice before I put them in the vegetable garden; each time, I put the root ball at the bottom of the larger pot and top off with more soil. Our weather is such that I take the potted plants outside to harden them off to the sunshine. The resulting plants are sturdy! Thanks Frances. I actually do something very similar with mine. I plant them in drinks cups initially, then repot deeper into sour cream or yoghurt tubs later. Apparently all those little hairs on the stem will form roots if buried under the soil. I lost quite a few of mine at the hardening off stage last year – I will definitely need to take a more gradual approach this year, working up from a few hours per day. My plants are much stronger this year, so hopefully (and perhaps with a little Norbert influence!) I might get them all safely planted out this year. Best of luck with your own plants! J.
Wow – sounds like you have lots going on, Cristina! I was just looking at your passata post – I’ll have to try that this year. (Although I have no squeezer – I’ll have to do it by hand!) I got a few beautiful zucchini flowers last year but I ended up not using them. I’ve never eaten them and wasn’t really sure what to do. I’ll have to make an effort this year as I believe they are delicious. Best of luck with your plants! Thanks for this lovely comment, Jennifer. I love the idea that your dad has traveled home and is guiding my gardening hand. I’m still relatively new to gardening so I do still need lots of advice. I’m with your dad on the D word. It’s just not a word I grew up with – it was either earth or soil. Dirt is something else entirely in my vernacular. 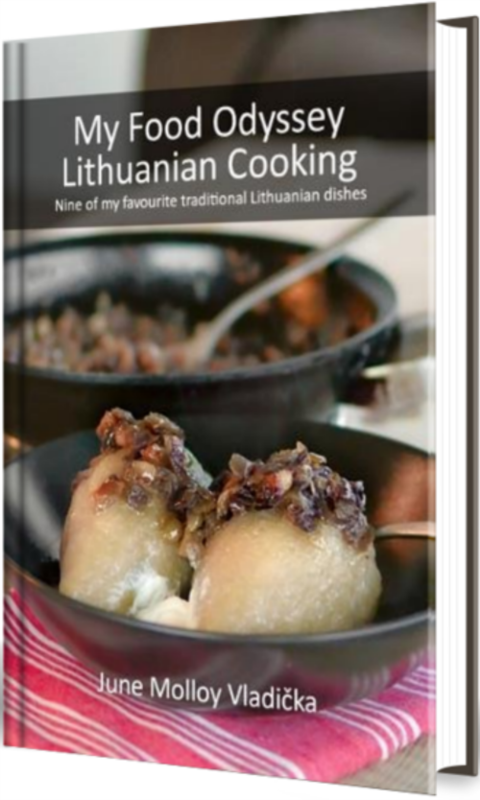 I will be canning tomatoes again this year, but I think the Lithuanian method is different from the US method. I’ll do a post on it later in the year. The fennel I’m hoping to chop and freeze. I haven’t tried freezing fennel before, though, so I’ll do a test batch first to make sure it doesn’t turn to mush like zucchini when defrosted. If it does I’ll have to come up with something else! I didn’t realise that about tomatoes, Jennifer. I knew you could freeze tomato sauces or pastes, but it never occurred to me to freeze actual tomatoes. I’m definitely going to try that – it’s much easier and quicker than canning. The fennel I’m a bit confused about as I’ve read different feedback on how well they freeze – mostly about losing their crunch when defrosted. I just read this morning (after reading your comment) that they are a “perennial grown as an annual”. I have NO idea what that means! I guess I still have a lot to learn. I find the best way to learn is to just try it and see what happens. Apparently it’s a bit tricky to grow, so if I get plants this year I’ll be delighted. If I get a repeat next year that will be a bonus! Hi June. Your plants look fabulous. We started seeds at the same time, but my seedlings are about 1/3 the size of yours. It’s that great sunroom you have. Sunlight is everything. I’m so jealous! Anyway, regarding the onion sets, I think it was a lunar issue. I heard the same thing but was told that they were not afraid of the cold. (Ne Bijo!). It was just the wrong lunar phase last week. I’m still struggling to accept the validity of that, but the research apparently is conflicting. Burning sulfur to kill fungus is a new concept for me. I wish I would have known before planting my greenhouse, which is now done. Oh well, maybe next year. Good luck with your growing season. It looks like you are going to be overrun with fresh veg for canning come fall! That sunroom really is fantastic for getting plants started, Suzana. It’s given me a great head start. Arunas tells me the lunar thing has to do with magnetic forces and the amount of water held in the soil. I haven’t looked into it, but waiting another week doesn’t delay me, so I’m happy to go along with the advice! I didn’t know about the sulphur either – it was the lady in the seed shop who recommended it. I actually did have some mushrooms growing and the tin was inexpensive, so I thought I’d give it a try. Best of luck with your own veg – they looked great last year, so I’m sure you’ll be busy at harvest time! I love reading your posts. Everything always looks so beautiful there! Your plants look great. Thanks Dana. There is something special about making traditional dishes in their country of origin using the local ingredients, especially if they’re homegrown. One of the things I love about Lithuania is that so many people still grow their own fruit and veg, even if it’s just a few core ingredients like cabbage and carrots. The taste can’t be surpassed. Hey Mira! Thanks for the lovely comment. I do love my herbal teas. Like you, I have mint after my dinner. I love the melissa later in the evening as a wind-down tea. The fennel seeds I planted are the same as the ones you use in cooking and I know of people who grow fennel from their kitchen stock. I got a separate packet (which was very inexpensive) as kitchen seeds can be older and more dried out, so might not germinate as well and I really wanted all mine to germinate. If you click on the “Growing Vegetables” button near the top of the page on the right side you can see a list of all my posts on growing fruit, veg and herbs, including all the processing and recipes. I’ll be continuing that this year, hopefully with even more posts on how I’m using my beautiful bounty. Inspiring post especially since I don’t usually grow anything but tomatoes. I saw a few things I wold like to try from your pinterest page. Have a good weekend. Thanks Julia! Enjoy your weekend! Fair play to you, lovely post!